Who Got Voted Off Dancing With The Stars All-Stars Tonight 11/20/12? Tonight on ABC it’s the DANCING WITH THE STARS ALL-STARS Season 15 third double-elimination and we are headed into the Finale. By the end of the evening, the three couples fighting it out in the finale will be left standing, and we will say goodbye to not one but two more contestants. Did you see last night’s performance show? We did and we recapped it here for you. We also have all the videos of last night’s performances here! After last night’s performances Shawn Johnson and Derek Hough are at the top of the leader board with a score of 59/100. Tied at the bottom of the leaderboard are Kelly Monaco and Val Chmerkovskiy and Emmitt Smith and Cheryl Burke with a 54/60. Logic dictates that the two couples with the tied lowest scores – Emmitt/Cheryl and Kelly/Val – will be leaving the competition, but unfortunately the cookie doesn’t necessarily crumble that way. We’ve seen high scoring couples take the fall alongside low scoring couples, so in the end, the competition comes down to your vote at home. We conducted a poll today and 40.31% of viewers are voting that Emmit will be going home. In second place is Kelly Monaco with 31.4% of the votes. There is still time to vote go HERE! Tonight’s results show will feature he UK’s new boyband sensation, The Wanted, will perform a medley of their current single “I Found You” and their biggest hit, “Glad You Came.” Legendary performer and world famous choreographer Paula Abdul returns to the ballroom to perform in our final “Macy’s Stars of Dance” with a groundbreaking number. This piece will be an amazing interactive performance featuring some outside dancers as well as our own pros, Mark Ballas, Chelsie Hightower, Sonny Fredie Pederson, Henry Byalikov, Sharna Burgess and Emma Slater. In our final “AT&T Spotlight Performance,” we will feature 21-year old Parris Goebel. Parris grew up in New Zealand and always knew she loved to dance, even though she was a self-described “terrible dancer.” Instead of taking classes, she taught herself how to dance, developing a new unique hip-hop style called “polyswagg,” and went on to become one of the hottest choreographers in the dance world. Tonight’s elimination show will see two couples bite the dancing floor dust. Who will it be? Which three couples will remain for the penultimate performance show next week? 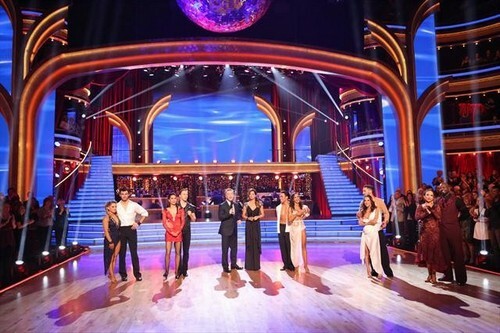 Who will be the ultimate DWTS champion? We will be live blogging Dancing With The Stars All Stars Result show tonight with all the up-to-the-minute details at 8PM EST so make sure to come back to this spot and watch the show with us. Refresh often to get the most up-to-date results! Tonight’s recap: Len opens the show by saying everyone gave their all last night, but the song they want to see the encore of is Apolo and Karina’s rumba. In the final “AT&T Spotlight Performance,” of the season 21-year old Parris Goebel was featured. Parris grew up in New Zealand and always knew she loved to dance, even though she was a self-described “terrible dancer.” Instead of taking classes, she taught herself how to dance, developing a new unique hip-hop style called “polyswagg,” and went on to become one of the hottest choreographers in the dance world. Paula Abdul returned to the ballroom to perform the final “Macy’s Stars of Dance” with a groundbreaking number. So tonight we lost Apolo and Emmit. Next week dancing for the mirror ball trophy.